It's been over a year since all the adults disappeared. Gone. In the time since every person over the age of fourteen disappeared from the town of Perdido Beach, California, countless battles have been fought: battles against hunger and lies and plague, and epic battles of good against evil. 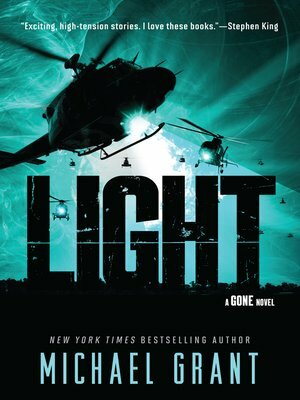 Light, Michael Grant's sixth and final book in the New York Times bestselling Gone series creates a masterful, arresting conclusion to life in the FAYZ. And now, the gaiaphage has been reborn as Diana's malicious mutant daughter, Gaia. Gaia is endlessly hungry for destruction. She yearns to conquer her nemesis, Little Pete, and then bend the entire world to her warped will. As long-standing enemies become allies, secrets are revealed and unexpected sacrifices are made. Will their attempts to save themselves and one another matter in the end, or will the kids of Perdido Beach perish in this final power struggle? Continue the series with Monster, the seventh of Michael Grant's bestselling Gone books, coming in fall 2017!